Perfecting a beautiful royal look is the dream of every Indian bride, whether in India or in the UK. Exquisite traditional jewellery such as necklace, ear rings and maang tikka is an important part of a stunning Indian bridal look. Thankfully, you can explore different varieties of traditional jewellery at the same designer store offering Asian bridal wear in London. While looking at traditional jewellery in Central London, you will come across different designs of maang tikkas. As Indian brides are going back to their roots, the maang tikka is witnessing a revival and regaining lost glory. Maang tikkas with detailed kundan work are quite the rage today. Many designs feature emeralds, rubies and pearls hanging at the bottom which adds to their feminine appeal. Extravagant necklaces are a crucial part of traditional jewellery in Central London. A neck or haar is something no bride can do without and it usually features a grand design. Consider a multi-layer polka necklace or a layered pearl necklace for making a big splash on the big day. Get more by choosing a kundan with ruby reverse necklace. 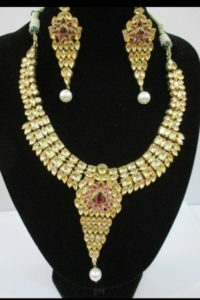 A kundan long necklace will look great for the nuptials. You have the choice to purchase a set with matching earrings or buy matching earrings separately. Earrings such as gold jhumkas, antique stonework earrings, kundan jhumkas, kundan chaand baalis are not only traditional but gorgeous as well. Asian bridal wear in London is incomplete without the addition of bangles to the look. Bangles are believed to represent luck and well-being. Traditionally, bangles for brides are bright coloured. Kundan and stonework bangles fit the bill perfectly. A big gold kada with green and red stones or a pearl paved gold bangles are a great way to make a style statement. The bride’s fingers are also decorated with jewellery to emphasize an opulent look. While the engagement ring is the most important piece of finger jewellery, the bride can sport other eye-catching designs such as a large kundan ring or emerald ring to match her earrings or bridal necklace. Whatever type of jewellery you choose to accessorize your outfit with, just make sure that it is of high quality. Traditional Indian jewellery is famous for intricately detailed designs and fine craftsmanship and your bridal jewellery pieces must reflect these features. Ready to be mesmerized by an exceptional selection of stunning traditional bridal jewellery pieces? Go to the premier Asian designer apparel store in Central London!